So since we moved out of our awful little flat to a proper house (enabling more frame building with it's lovely large garage), I've settled into a bit of a morning routine. Perry and I get up around 6:30 (having been woken by the cat), I make coffee while he feeds the cat, then we pop some fresh food and water in the rabbit's bowl and put her outside for the day (she stays inside overnight to protect her from neighbourhood cats). Perry usually has brekky out, so I drop him off at the station, then come home and spend an hour or so working on bike stuff before getting ready for work myself. This has come to be one of my favourite times of the day. The house is nice and quiet because Kristyn is yet to wake, so I sit at the computer, or clean lugs, or whatever, while our cat sits on whatever I'm doing. Just now there was a bit of a racket outside. 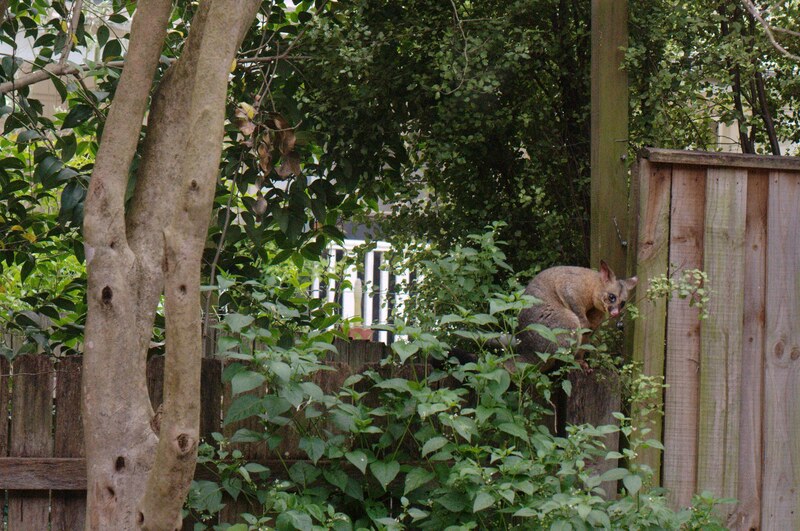 I looked up and saw one of our neighbourhood possums wandering along the fence. All is right with the world. Your possums are nowhere near as hideous as American ones are. Would you add more to your paint set up Suzy. I'm an amatuer builder too but havent yet attempted spaying because I dont have a purpose built shop. But neither obviously do you. So what is your set up? It appears to be a cubicle on a table inside your regular workshop. How do you cope with spatter for instance? Thanks and your work is as good as any pro builder IMHO. Number six ready for paint.